All transactions are safe and secure with a reliable history in online purchasing behind each of our associates. Buy the Viva Las Vegas t-shirt to own Elvis clothing and merchandise. "Bright light city gonna set my soul, gonna set my soul on fire. Got a whole lot of money that's ready to burn so get those stakes up higher." This should be the official Las Vegas theme song! The King loved the city so much that you can hear the passion in his performances. 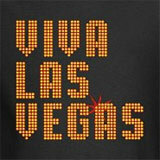 Celebrate his "Vegas Years" with this Viva Las Vegas t-shirt. If you prefer his earlier years, stroll through the rest of our Elvis t-shirts. In addition to the Viva Las Vegas tee above, browse the Elvis Clothing Gallery for more apparel like men's and women's clothes, kids shirts or hoodies.